It is well established that hearing loss is common among children with Down syndrome, although the reports of the prevalence and the extent of these difficulties vary. Hearing problems make it more difficult to learn spoken language and develop clear speech. Despite the importance of hearing for development, there is a lack of research and consensus on the most effective treatment options. Children's hearing abilities are impressive from the first weeks of life but continue to develop through childhood influenced by the development and function of the ear, auditory nerves and auditory cortex as the child experiences sounds. While there has been a great deal of research into the hearing abilities of typically developing children there has been very little research into the hearing development of children with Down syndrome. What research there is has largely documented the extent of hearing loss due to problems in the ear. Hearing impairments can be sensory-neural (due to impairments in the inner ear (cochlea), auditory nerves or auditory cortex), conductive (often due to fluid in the middle ear) or mixed (both sensory-neural and conductive). The degree of hearing loss is measured in decibels (dB) by measuring how loud a sound has to be above 0dB to be heard (hearing threshold). The range for normal pure tone hearing average threshold is 0-25dB, mild loss 26-40dB, moderate loss 42-60dB and severe hearing loss >60dB. There are many studies reporting hearing loss in children with Down syndrome and prevalence rates of hearing loss range from 34%-78%. The differences in rates reported are partly due to different age ranges of children studied as it is suggested that the prevalence of conductive loss decreases with age while the prevalence of sensory-neural loss may increase with age. Some studies have drawn on clinic groups of children and others have reported population groups which offer more reliable estimates of overall prevalence. A population study of 8 year olds with Down syndrome in Norway found that 35% of the 49 children had hearing loss. In the hearing impaired group, 26% had mild, 6% moderate and 2% severe hearing loss. The underlying causes were 16% conductive, 18% sensory-neural and 6% mixed. Two thirds of the hearing impaired children had bilateral loss - both ears were affected. To put the extent of hearing loss among the children with Down syndrome in context, the study included a group of 57 typically developing children for comparison and only 1 (2%) had a loss >25dB. The pure tone hearing average for this group was 7.5dB and for the children with Down syndrome 27.0dB. There was only one child with Down syndrome with bilateral thresholds better than 15dB in whole population. This research team also looked at the prevalence of OME (otitis media with effusion) in this group and OME was found in 38% of the children with Down syndrome at the time of the assessment and two thirds of these children had a history of OME. OME is considered to be the major cause of conductive hearing loss. Not all the children with OME actually had hearing loss as verified hearing loss above 25dB in better hearing ear was found in 12 of 20 (60%) with OME and 5 in 31 (16%) without OME. However overall the group with OME had significantly poorer hearing with mean pure tone hearing average 33.4 dB HL (range 14-70dB) compared with a mean 21.7 dB (range 6-80dB) for the group with no OME. A population study in Scotland considered the prevalence of OME in 79 children from 9 months to 6 years and found OME present in 93% of children at age 1 and 68% at age 5 years. Referral for surgery depended on OME plus moderate to severe hearing loss and 37% were referred for surgery at some point (removing adenoids and/or tonsils, and/or inserting grommets (drainage tubes). Many had OME that was not causing significant hearing problems. Only 4 children had hearing aids. In addition 79% of this group of children with Down syndrome had current upper airway obstruction or adenoids/tonsils removed by age 5. The team report that grommets were largely successful and without serious side effects therefore they recommend surgical treatment for OME in pre-schoolers. In contrast the Norwegian team recommend that non-surgical treatment may be preferable and mention good tolerance of bone-anchored hearing aids - which can be supplied on a headband rather than bone anchored for young children. These two different points of view about treatment options are common between ENT teams in different places and confusing for parents. With the introduction of newborn hearing screening (NBHS) in many countries we now have some data on rates of hearing loss at birth and in the first year of life. In a large US study of 332 infants with Down syndrome, 87 (26.2%) failed the NBHS and 33 (37.9%) of these had serious otitis media, 5 had sensory-neural loss and 3 a mixed loss. However 16 (18.4%) had no hearing impairment later. Overall in this large infant group, 42.5% had normal hearing and 46.1% had hearing loss (11.4% no follow up). Of those with hearing loss, in 88.2% it was conductive, in 3.9% sensory-neural, in 2% mixed and in 5.9% the cause was not determined. More than 43% of the newborns who passed the NBHS developed conductive hearing loss requiring grommets later. This team supported the aggressive and surgical approach to managing OME recommended by Shott and colleagues. In another US study of 109 newborns, 28 (26%) of the children with Down syndrome failed the NBHS. Hearing loss was later confirmed in 15 of 19 (79%) of those who failed NBHS and 11 had bilateral loss, 4 unilateral loss. (For comparison, some 0.25% of all newborn babies fail the NBHS). Many studies have measured hearing when assessing language or verbal memory in children and teenagers with Down syndrome and reported results have been mixed with some finding links and other not. However, in these studies hearing is measured at the time of the study. They do not take account of the child's hearing history during the critical years for learning language (from infancy to early primary years) when the impact may have been the greatest. Secondly, individuals with moderate or severe hearing loss were often not included in the studies as they may have had difficulties completing the tasks - so the samples are not representative and cannot speak to the effects of hearing loss in the population. Recently, two studies in the UK report evidence on a negative effect of hearing loss in preschool years on speech and language development. In one study of 41 children mean age 6 years 5 months (range 3;9 to 11;1) 16 (39%) had experienced moderate to severe hearing loss between the ages of 2 and 4 years. Hearing loss was established from audiology clinic records and parent report. 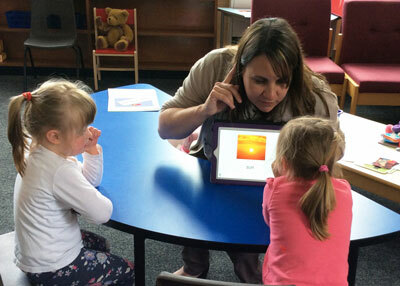 The progress of this preschool hearing impaired group in their school years was compared with the group with no significant preschool hearing loss. The hearing impaired group had significantly poorer performance on measures of language comprehension, expressive language, receptive vocabulary and speech accuracy even when the influence of age and non-verbal abilities were taken into account. A subset of the children (24) were asked to tell a story to pictures (a narrative) and of the 8 children in the hearing impaired group only 2 could provide a narrative compared with 13 of the 16 children without hearing impairment. In the second study, 22 children with Down syndrome with a mean age of 4 years 9 months (range 4;4 to 5;11) were recruited and assessed on a range of developmental and health measures then and 15 months later. Parent reported that 31.8% had hearing difficulties, 18.2 % had had grommets, and 4.2% hearing aids. Hearing difficulties were related to language development at the first assessment and more strongly related 15 months later - those with hearing difficulties having poorer language. These findings are not surprising as babies start learn language and to tune in to the speech they hear in the first year of life. 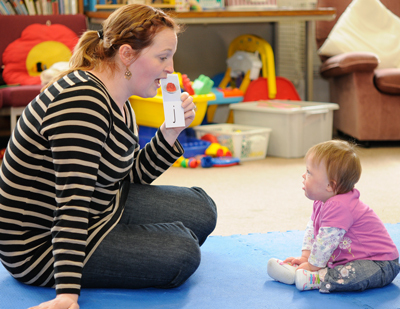 As children with Down syndrome also have learning difficulties their speech perception and language learning may be affected by even mild degrees of hearing loss (25-40dB). Parents are advised of the high risk of fluctuating hearing loss and that most children will have OME at some point. As prevention and treatment of conductive hearing loss are not easy parents are advised that compensations such as having eye-contact with child when talking, using signs with speech, speaking at a reasonable volume and avoiding constant background noise are important for all children. In the classroom, there is a small study suggesting that using a soundfield system may be beneficial. Panneton, R. & Newman, R. (2012) Development of speech perception. In. L. Werner, Fay, R.R. & Popper, A.N. Human Auditory Development. pp197-222. Springer: NY.